Why are readers who are generally at home with narrative and discursive prose, and even readily responsive to poetry, far less confident and intuitive when it comes to plays? The complication lies in the twofold character of the play as it exists on the page - as a script or score to be realized, and as literature. 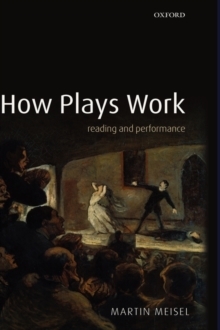 Martin Meisel's engaging account of how we read play plays on the page shows that the path to the fullest imaginative response is an understanding of howplays work. What is entailed is something like learning a language - vocabulary, grammar, syntax - but learning also how the language operates in those concrete situations where it is deployed. Meisel begins with a look at matters often taken for granted in coding and convention, and then - under 'Beginnings' - at what is entailed in establishing and entering the invented world of the play. Each succeeding chapter is a gesture at enlarging the scope: 'Seeing and Hearing', 'The Uses of Place', 'The Role of the Audience', 'The Shape of the Action', and 'The Action of Words'. The final chapters, 'Reading Meanings' and 'Primal Attractions', explore ways in which both the drive forsignificant understanding and the appetite for wonder can and do find satisfaction and delight. Cultivated in tone and jargon-free, How Plays Work is illuminated by dozens of judiciously chosen examples from western drama - from classical Greek dramatists to contemporary playwrights, both canonical and relatively obscure. It will appeal as much to the serious student of the theatre as to the playgoer who likes to read a play before seeing it performed.